The phenomenon of this piece continues unabated from the renaissance right up to the present day, and its popularity has never really waned. 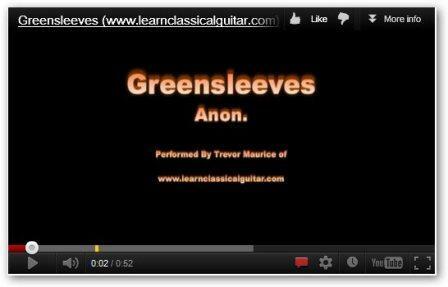 Green Sleeve, or Greensleeves is a traditional English ballad written by an anonymous composer and has become a most famous piece in terms of guitar history. It is often said that King Henry VIII wrote Greensleeves about Anne Boleyn, but this isn't really probable due to stylistic differences of the time. 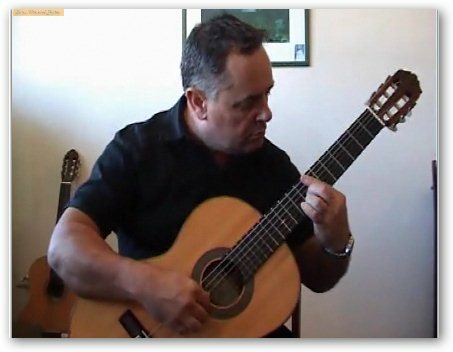 This classical guitar lesson by Giuliani is a powerful exercise for right hand arpeggio technique. 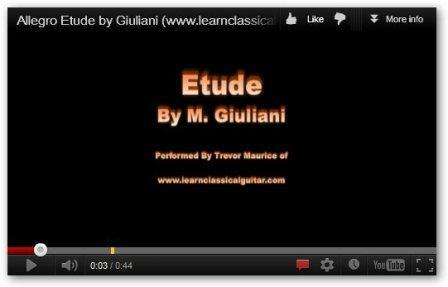 Giuliani had made a name for himself as a virtuoso of guitar by the time he was nineteen. He was also adept at the flute and violin and by the time he died had added the title of "highly talented composer" to the list of achievements. 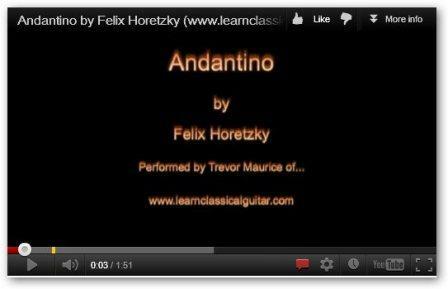 This Andantino by Felix Horetzky will help with practicing music in 6/8 time. That means there are six eighth note beats per bar (or the mathematical equivalent). The "accent" of the beats or pulse thus become: strong; weak; weak; medium; weak; weak. Felix Horetzky was born in Poland in 1796 and died in 1870. He learnt guitar when young, but it wasn't until his mid-thirties that he went to Vienna to study guitar under Mauro Giuliani. 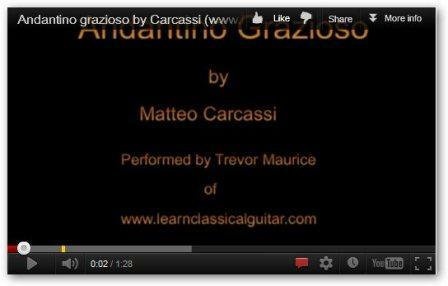 This Andantino free guitar lesson by Felix Horetzky will help with practising music in 6/8 time. That means there are six eighth note beats per bar (or the mathematical equivalent). The "accent" of the beats or pulse thus become: strong; weak; weak; medium; weak; weak. Felix Horetzky was born in Poland in 1796 and died in 1870. He learnt guitar when young, but it wasn't until his mid-thirties that he went to Vienna to study guitar under Mauro Giuliani. 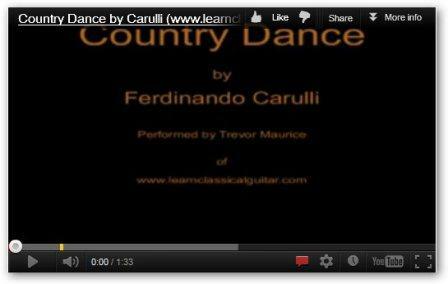 This easy free guitar lesson by Carulli is an excellent way to practice simplified arpeggios. It is also good for alternating "i.m." fingers with the thumb (providing bass). It is also a piece that highlights the classical era technique of using a major key, then the related minor key in the middle section and returning to the major key again in the last section. 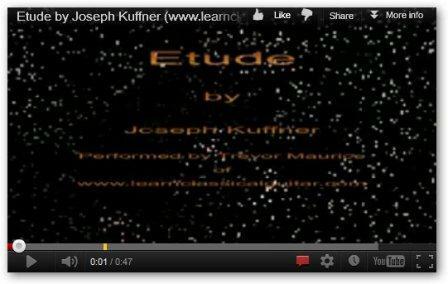 This Kuffner Etude is great for practising slurs, a.k.a. hammer-ons and pull-offs. On the trill technique page, you can see how to do this more effectively. You also get to use the little finger of the left hand occasionally throughout the piece. In the past, many students I've had try to avoid using the little finger because it is obviously a "weaker" finger, but I maintain the more you use it the stronger it will become. Indeed, Joseph Kuffner wrote many of these little study pieces purposely to strengthen the fingers and secure guitar technique. 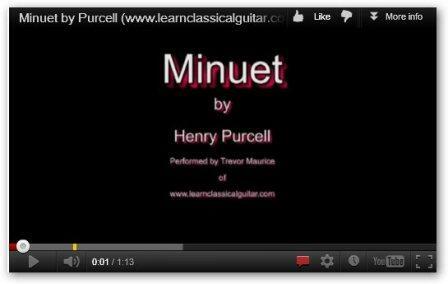 Henry Purcell was an English Baroque composer. 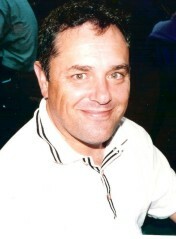 He has often been called England's finest native composer. Purcell incorporated Italian and French stylistic elements but devised a peculiarly English style of Baroque music. 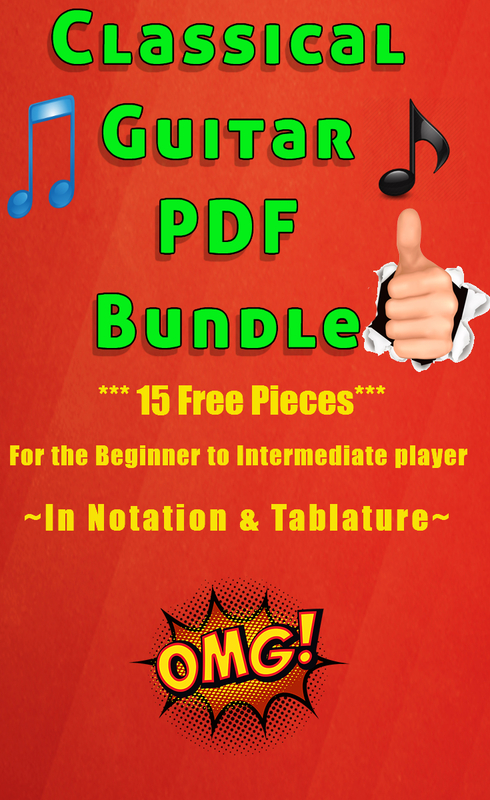 Although he was a Baroque composer (who wrote for the lute) there are several, quite useful and varied, lessons for the classical guitar player contained within this piece. For instance the Use of the closed "b" on the third string, fourth fret, is useful for developing the use of the little (often weaker) finger. 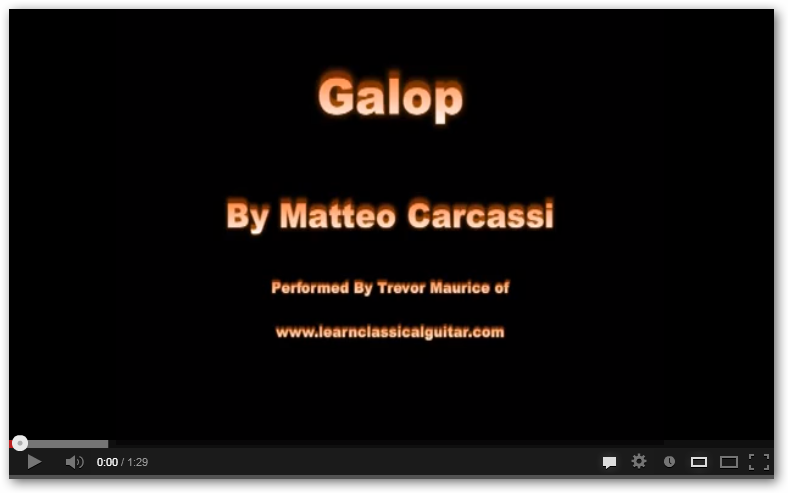 This free guitar lesson by Carulli is an excellent way to practice your left hand slur technique. Carulli was born in Italy in the same year as Beethoven (1770) he became one of the most popular and loved classical guitar composers and players of his time. Indeed, that love extends right up to the present day as new generations of guitarists "find" his music and make it their own. 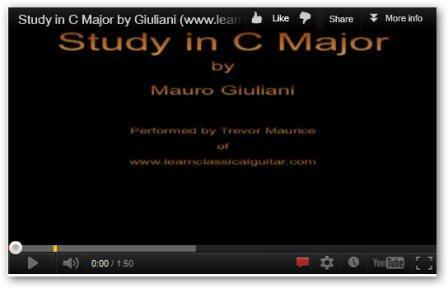 This Study in C by Giuliani is great for developing your thumb technique as much of the melody resides in the bass, in this piece. Actually, the melody continually switches from the bass to the treble, but the bass has a large part of this. 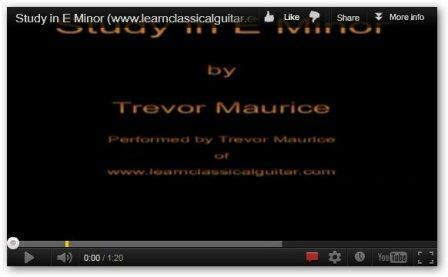 I recently wrote this little E Minor classical guitar lesson to highlight the fact that the melody can be expressed from both treble notes and bass notes combined. That is the melody doesn't always have to reside in the treble notes alone but can be "inter-twined" with the bass notes. If you play the bass notes and treble notes separately, you'll hear just what I mean. Although Tyrolean Dance; by Josef Kuffner, is deemed to be very easy, there are many small yet important lessons that can be learned by analysing it properly. When playing double notes is vitally important to aim to play them legato and this free guitar lesson is great practice for legato! 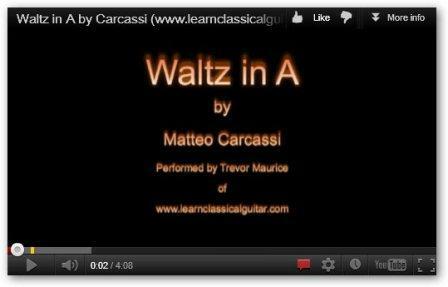 Waltz by Carcassi is typical of him when writing excellent beginning works for classical guitar. As I've said on another page... "When Carcassi was born in 1792, Carulli was already making a name for himself as a 22 year old, Sor was a rapidly improving 14 year old at the Monserrat monastery, and Giuliani was receiving tuition on the violin, flute and guitar as an 11 year old. Who was to know that in time that he would join these luminaries as one of the most famous names in classical guitar history. If you need more basic training before you can make use of the free guitar lesson page go here... or, simply enter whatever term you're searching for e.g. if you're searching for all pages that mention the word "Segovia" just type in that term and away you go! You can even search the Web. 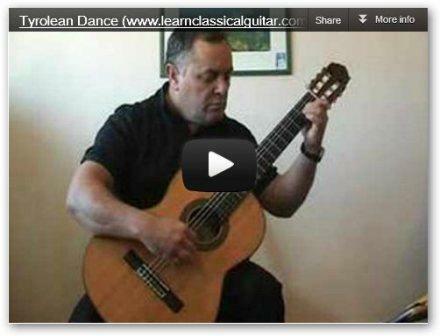 Just enter "classical guitar" followed by your search word(s). I hope you find me again!